On October 19th, 2017, the Panoramic Survey Telescope and Rapid Response System-1 (Pan-STARRS-1) in Hawaii announced the first-ever detection of an interstellar asteroid, named 1I/2017 U1 (aka. ‘Oumuamua). In the months that followed, multiple additional observations were conducted that allowed astronomers to get a better idea of its size and shape, revealing it to be strangely cigar-shaped, roughly 400 metres (1312 ft) in length and approximately 40-50 metres (130-162.5 ft) in height and width, tumbling through space. These observations also showed it may be composed of dense metal-rich rock, and that it had the characteristics of both a comet and an asteroid. 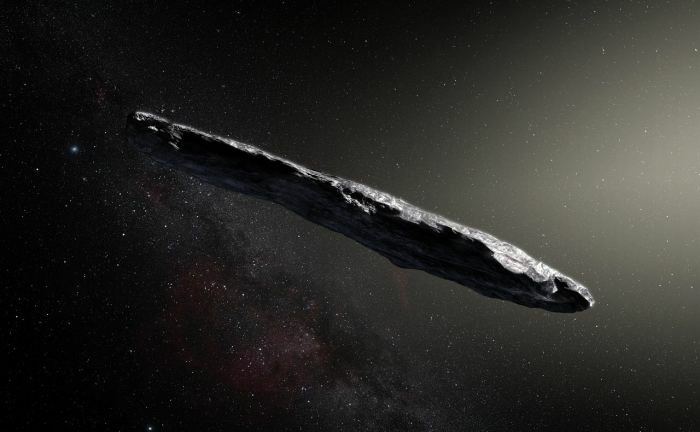 However, the report on ‘Oumuamua (roughly translated as “scout”, ou being Hawaiian for “reach out for” and mua meaning “first, in advance of” – which is repeated for emphasis) that captured public imagination is the idea that the object may have been an interstellar probe. At the heart of this idea is the fact that ‘Oumuamua accelerated away from the Sun faster than would have been the case of it receiving a “gravity assist” in swinging around our star. Initially, it was suggested that the additional acceleration was the result of the off-gassing of volatiles – frozen water, etc., that had been heated during ‘Oumuamua’s close swing around the Sun. However, no such off-gassing had been observed when the object was closer to the Sun, which would have been expected. 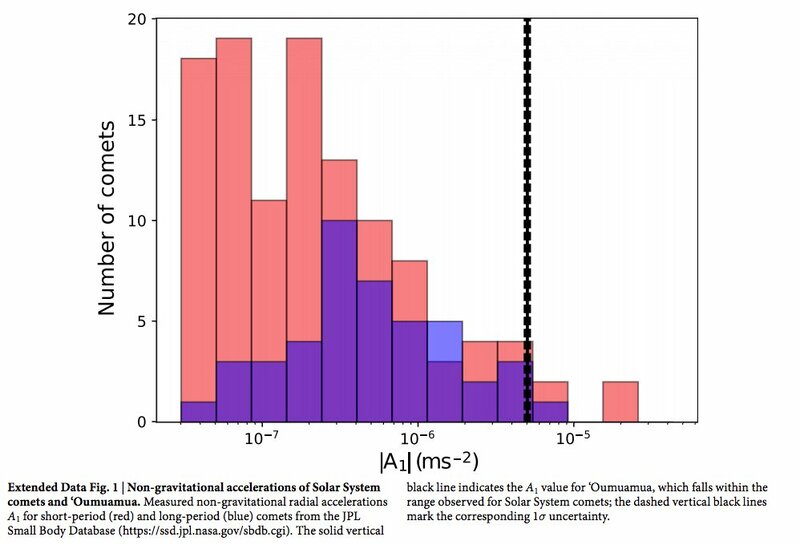 In June 2018, an alternative explanation for the acceleration was posited: that it was the result of solar pressure being exerted on the object. However, at the end of October 2018, Shmuel Bialy, a post-doctoral researcher at the CfA’s Institute for Theory and Computation (ITC) and Prof. Abraham Loeb, the Frank B. Baird Jr. Professor of Science at Harvard University, went one stage further. They proposed that while ‘Oumuamua might well be natural in origin – it could also be the object is in fact an alien probe, intentionally sent to our solar system and which uses a light sail (or what we’d call a solar sail were it to be used with a probe sent from Earth to explore out solar system) for propulsion. Currently there is an unexplained phenomena, namely, the excess acceleration of ‘Oumuamua, which we show may be explained by the force of radiation pressure from the Sun. We explain the excess acceleration of `Oumuamua away from the Sun as the result of the force that the Sunlight exerts on its surface. For this force to explain measured excess acceleration, the object needs to be extremely thin, of order a fraction of a millimetre in thickness but tens of meters in size. This makes the object lightweight for its surface area and allows it to act as a light-sail. Its origin could be either natural (in the interstellar medium or proto-planetary disks) or artificial (as a probe sent for a reconnaissance mission into the inner region of the Solar System). Their views were circulated to various news outlets via e-mail and cause something of a stir in the first week or so of November. As no signals were found to be emanating from the object, rather than drop the idea of it being artificial, Loeb has put forward the ideas that it has either malfunctioned, or it is active, and we simply can’t detect the fact that it is. He’s even suggested that given Pan-STARS only managed to spot the object after it has passed perihelion, could mean that it is only “one of many” such probes sent our way, and we’ve missed the others. Bialy has been a little more cautious with things, pointing out the paper is “high speculative”. But the fact is, the paper does come across more of an attempt to substantiate a belief (that ‘Oumuamua is of artificial origin) than anything else, and in doing so, it does ignore certain data and makes some sweeping assumptions. For example, the paper tends to dismiss the idea that ‘Oumuamua’s unexpected acceleration was consistent with a push from solar radiation pressure. 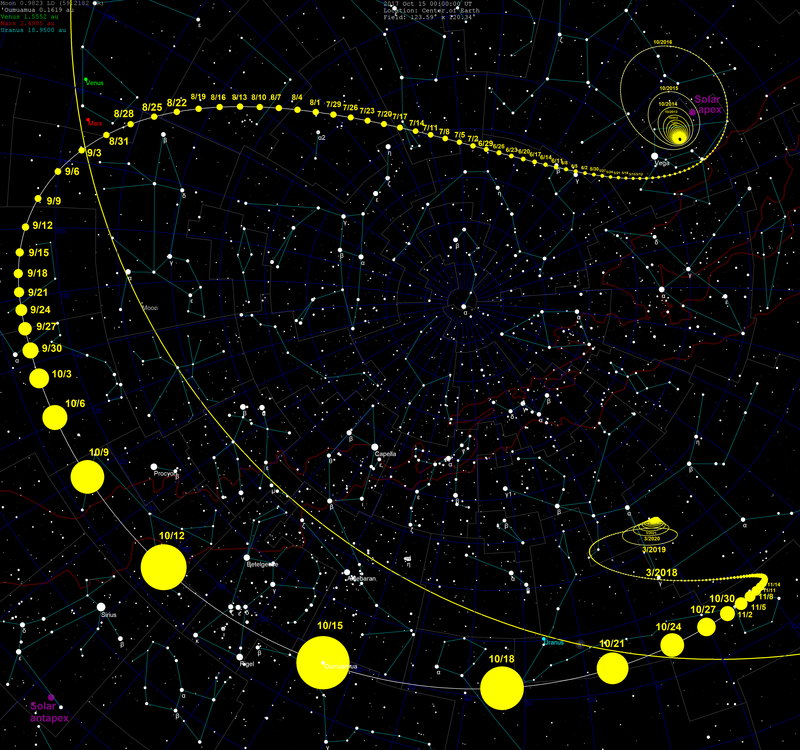 However, Michele Bannister, a planetary astronomer from New Zealand and one of many to push back against the “ET probe” idea via Twitter, used a graphic that shows the acceleration exhibited by ‘Oumuamua’s is entirely in keeping with similar non-gravitational accelerations seen with comets within the solar system. Like most scientists, I would love there to be convincing evidence of alien life, but this isn’t it. [Data] has already shown that its observed characteristics are consistent with a comet-like body ejected from another star system. And some of the arguments in this study are based on numbers with large uncertainties. At present, ‘Oumuamua is beyond the orbit of Jupiter and will pass beyond Saturn in 2019 – although it will be another 20,000 years before it leaves the solar system and re-enters interstellar space. 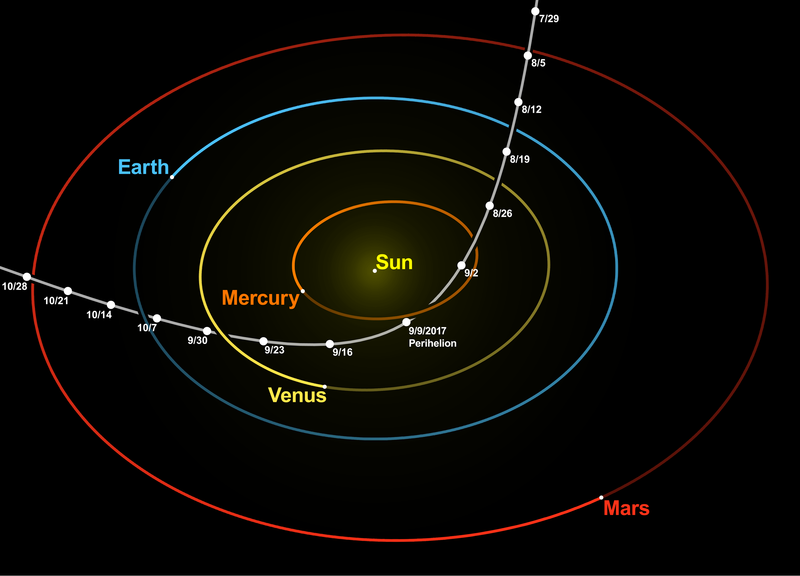 Trajectory data further suggests that ‘Oumuamua came to us from the vicinity of Vega (although it may not have originated from there). Taking its velocity into account, astronomers believe the journey from Vega probably took around 600,000 years – although some suggest its likely point of origin could be the Carina nebula, 8,000 light years away, in which case, ‘Oumuamua may have been travelling through the galaxy for 45 million years. The fact is, we’ll probably never know where it originated, just as the idea that it is of artificial design can never be ruled out for certain. But, when weighing the chances of ‘Oumuamua being some kind of alien probe, zipping through our inner solar system like the vessel from Arthur C. Clarke’s Rendezvous With Rama, against it being a piece of natural interstellar debris, Occam’s Razor does tend to point to the latter rather than the former. In September, I covered the SpaceX announcement that the company plans to use its upcoming massive Big Falcon Rocket (BFR) and Big Falcon Ship (BFS) to fly a group of private citizens around the Moon. As a part of that announcement SpaceX CEO, Elon Musk gave an updated on the state of development for BFR / BFS and outline a rough roadmap on development. In particular, the BFS shown at the time was a major departure from earlier iterations of the design. In particular, it now sports three large fins at its rear end. All three are intended to be landing legs – the BFS being designed to land vertically – with two of them actuated to move up and down as flight control surfaces during atmospheric decent. These are matched by two forward actuated canards, also designed to provide aerodynamic control during a descent through an atmosphere. 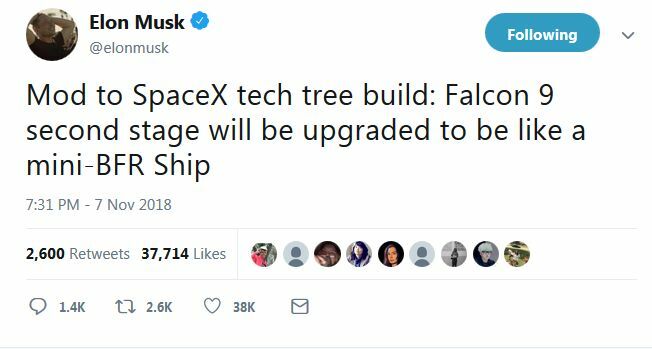 That announcement left a lot of people in the space community keeping an eye on SpaceX for further updates, and in a tweet in November 7th, 2018, Musk revealed the next step along the road to developing the BFR / BFS will be to fly a “mini BFS” atop a Falcon 9 or possibly a Falcon Heavy launch vehicle. 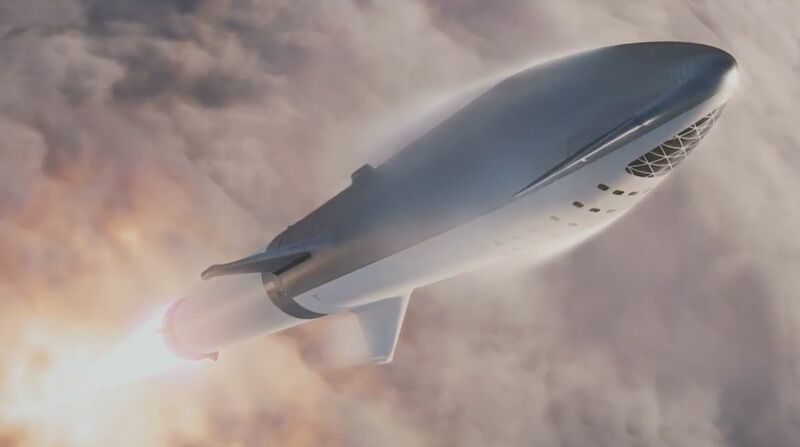 When pressed for a time frame for the first flight, Musk indicated the company will be aiming for around June 2019, and the flights will be launched from the SpaceX test facilities near Brownsville, Texas. Such an aggressive time frame suggests the “mini-BFS” will not be an actual scale model of the Big Falcon Spacecraft, but a close facsimile, possibly using a modified upper stage of the Falcon 9. The focus of the tests will be to place the upgraded Falcon upper stage into orbit, and then using it to test an ultra light” heat shield through re-entry and also test aerodynamic control surfaces of the type proposed of BFS through high Mach speeds. However, as the Falcon 9’s upper stage motor is optimised for operating in a vacuum, the test flights will not include any attempt to try to land the test vehicle propulsively. However, this does not necessarily mean the test article will be lost. SpaceX will try to bring a rocket upper stage back from orbital velocity using a giant party balloon. And then land on a bouncy house. – Elon Musk tweeting in April 2018. 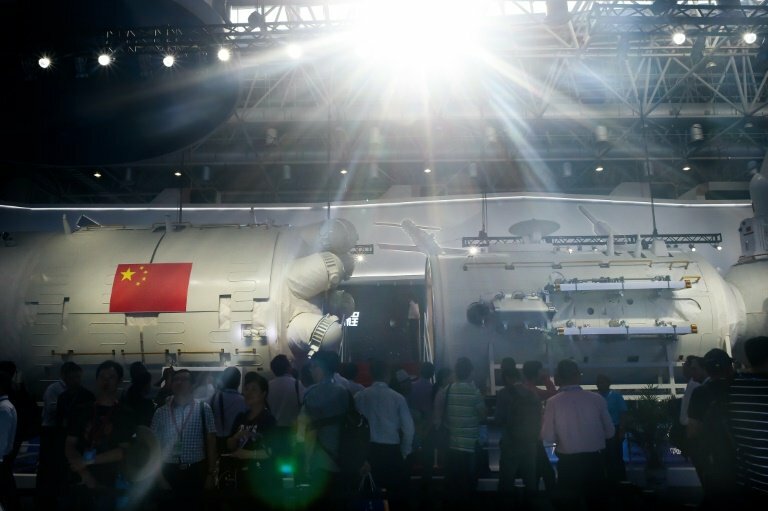 China has unveiled a full-scale replica of the core module of its new space station, Tiangong-3 at the Biennial Airshow in the southern coastal city of Zhuhai, which is also the country’s main aerospace industry exhibition. Tianhe-1 replica at the Chinese biennial airshow. Called Tianhe-1 (“Harmony of the Heavens”) the core of module is some 18 metres in length – making it somewhat smaller than the core elements of the International Space Station (ISS). Tianhe-1 is scheduled for launch in 2020, and includes a multi-axis docking port. Once in orbit, it will be joined by two living / science modules attached to the multi-axis port system, with the entire 60-tonne station due to be declared operational in 2022, and remain so for around 10 years. In addition, China has reaffirmed the station will be open “all countries” to conduct science experiments, and national and international research institutes, universities, and public and private companies have been invited to propose projects to fly on the station. 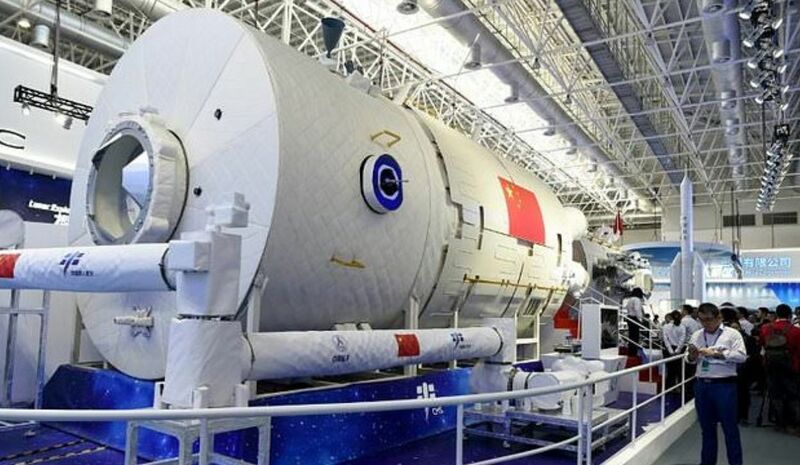 According to Chinese state media covering the unveiling of the module replica, some 40 plans from 27 countries and regions have been received, according to state media. One organisations that has replied is the European Space Agency, which has already sent members of the European Astronaut Corps to China to receive training (including language training) in order to participate in missions to the completed Tiangong-3. One country unlikely to participate in the programme will be the United States, where the hope is commercial operators will take up the challenge of operating and providing orbital facilities as the US ends it support for the International Space Station.